Today President Obama boasts about telling Vladimir Putin to "cut it out" with hacking attacks targeting the U.S. elections, but less than five years ago he was caught on a hot mic telling then-President Dmitry Medvedev that he would have "more flexibility" on issues important to Russia. 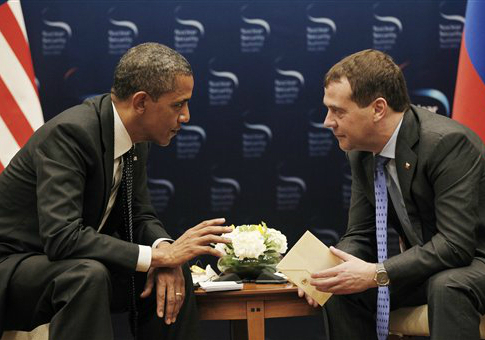 "On all these issues, but particularly missile defense, this, this can be solved but it's important for him to give me space," Obama told Medvedev in March 2012 during a Nuclear Security Summit in Seoul, South Korea, before Putin took over the Kremlin. "This is my last election," Obama said. "After my election I have more flexibility." Now Barack Obama, with the support of the Democratic Party, is talking tougher about Russia and Putin as Donald Trump prepares to take office. According to some, this tough talk follows years of accommodating and failing to stand up to Moscow. Obama assumed a critical tone when discussing Russia during his final press conference on Friday, claiming that he personally told Putin to "cut it out" when he learned about Russia's hacking to influence the U.S. presidential election. Obama also said he threatened "serious consequences if he [Putin] didn't." However, Obama has been criticized by some for not retaliating against Russia for the hacks, as promised, and for being slow to expose Russia's culpability. The president told National Public Radio last week that the U.S. government would take action against Moscow "at a time and place of our own choosing." In 2012, several months after the hot mic incident with Medvedev, Obama criticized Mitt Romney for calling Russia the United States' top "geopolitical foe," accusing the GOP presidential nominee of having an outdated foreign policy outlook during a debate. "Governor Romney, I'm glad that you recognize that al-Qaeda is a threat, because a few months ago when you were asked what's the biggest geopolitical threat facing America, you said Russia, not al-Qaeda," Obama said. "The 1980s are now calling to ask for their foreign policy back because the Cold War's been over for 20 years," Obama continued. "When it comes to our foreign policy, you seem to want to import the foreign policies of the 1980s, just like the social policies of the 1950s, and the economic policies of the 1920s." Less than two years later, Russia invaded Ukraine and annexed the country's Crimean Peninsula. Russian-backed separatists have been fighting government forces in eastern Ukraine since, stirring up fears among some NATO member states about the possibility of further Russian aggression. The United States and European Union have sanctioned Russian individuals and entities for their involvement in the years-long conflict, but the measures have not stopped the fighting. Obama has been criticized for not doing more to stop Russia, such as providing Ukraine with lethal aid as recommended by members of Congress. Despite a breakdown of relations with Russia over Ukraine and the ongoing civil war in Syria, the Obama administration sought to increase its military cooperation and information sharing with Moscow on Syria this summer. A fragile Syrian ceasefire brokered by the United States and Russia collapsed in September, as Russian and Syrian warplanes bombed civilians in Aleppo, a rebel stronghold at the time. The Assad regime has since taken complete control of the city. In his first term, Obama and Secretary of State Hillary Clinton collaborated on a failed "reset" policy with Russia. The reset was meant to reverse what Obama described as a "dangerous drift" in bilateral cooperation between the United States and Russia. Obama and other Democrats scrutinizing Russia appear to be motivated by political opposition to Trump, who has made favorable and often controversial statements about Putin and the U.S. relationship with Russia. Trump has cast doubt on reports that the intelligence community concluded that Moscow intervened in the U.S. election to help him win. "Not much happens in Russia without Vladimir Putin," Obama said Friday, all but blaming Putin for the cyber attacks. "This happened at the highest levels of the Russian government." Republican and Democratic leaders in Congress have called for investigations into Russian cyber attacks connected to the election. This entry was posted in National Security and tagged Barack Obama, Obama Administration, Russia, Vladimir Putin. Bookmark the permalink.